An innovative design with kids's love of fun in mind, this contemporary style bunk bed features drawing boards that will let creativity thrive and imaginations soar. 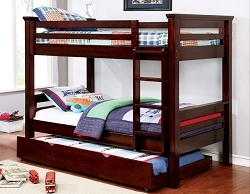 Will fence style guard rails your child can safely sleep, climb and more in absulute confidence. Drawing white board on both sides, 13 pc slat kits included. Available in Dark Walnut and Blue.